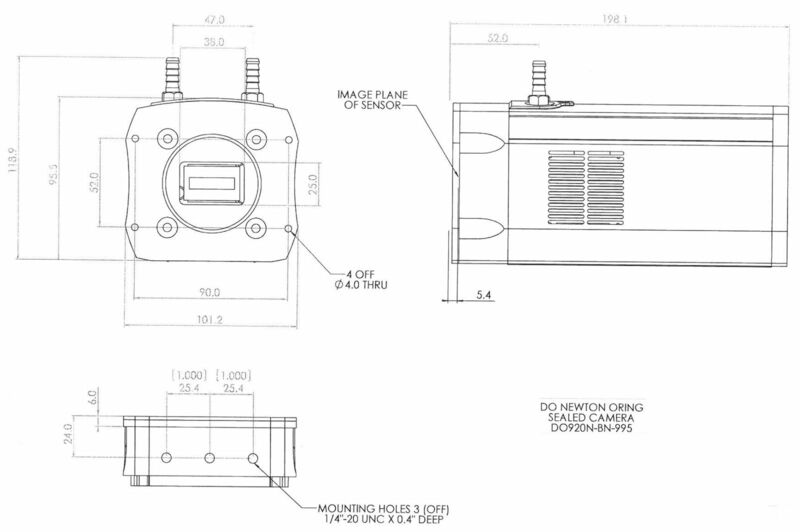 We do not have a wafer fab or foundry for making CCD sensors at McPherson. We buy these cameras. A CCD array detector can speed up data acquisition of spectra – collecting a whole spectrum in the time scanning acquires one point. 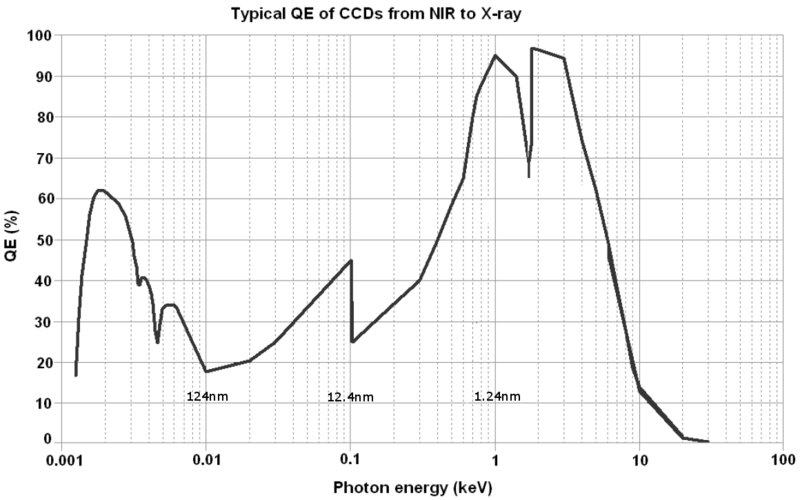 Direct detection CCD sensitivity is better in the soft x-ray, extreme and vacuum ultraviolet (response graph below). CCDs enable rapid data collection, imaging spectroscopy and more. For now, because pixels are relatively large, monochromator exit slits with single channel detectors provide better spectral resolution and faster data acquisition. Many companies integrate the same sensors fabricated by companies like e2v in England. We have good experience with different suppliers. Trusted suppliers include Andor-Technology (now Oxford Instruments) and Princeton-Instruments. 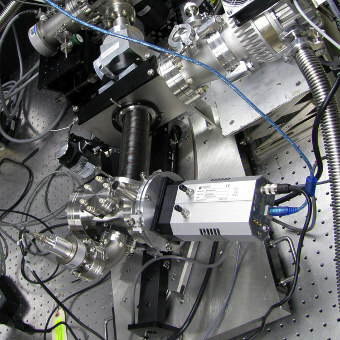 Princeton's 64-bit LightField software now controls McPherson’s deep UV and soft X-ray spectrometers and Princeton Instruments soft x-ray cameras too. Integration couldn't be easier. Other companies like Raptor Photonics and greateyes and even Hamamtsu have items on offer for deep ultraviolet wavelengths. Our scintillator coatings and microchannel plate intensifier can make any CCD a viable sensor of short wavelength light. Here are a few different ways array detectors can fit to your spectrometer. Call on us -- we will help if we can. Abstract: This paper is a report on our effort to use reflectance measurements of a set of amorphous silicon (a-Si) and uranium (U) multilayer mirrors with an uranium oxide overcoat to obtain the optical constants of a-Si and uranium. The optical constants of U, its oxides, and Si, whether crystalline or amorphous, at 30.4 and 58.4 nm in the extreme ultraviolet (EUV) are a source of uncertainty in the design of multilayer optics. Measured reflectances of multilayer mirror coatings do not agree with calculated reflectances using existing optical constants at all wavelengths. We have calculated the magnitude and the direction of the shift in the optical constants of U and a-Si from reflectivity measurements of DC magnetron sputtered a-Si/U multilayers at 30.4 and 58.4 nm. The reflectivity of the multilayers were measured using a UV hollow cathode plasma light source, a 1 meter VUV monochromator, a back-thinned CCD camera, and a channeltron detector. These reflectance measurements were verified by measurements made at LBNL. The reflectances of the multilayer coatings were measured at 14.5 degrees from normal to the mirror surface. The optical constants were calculated using IMD which uses CURVEFIT to fit the optical constants to reflectivity measurements of a range of multilayer mirrors that varied over a span of 150 - 25.0 nm bilayer thickness. The effects of surface oxide and roughness, interdiffusion, and interfacial roughness were numerically subtracted in fitting the optical constants. The (delta) , (beta) determined at 30.4 nm does not well match the values of c-Si published in the literature (HBOC1), but do approach those of a-Si as reported in literature (HBOC). The difference in the optical constants of c-Si and a-Si are larger than can be attributed to differences in density. Why the optical constants of these two materials vary at 30.4 remains an open question.